The summer has started out fun as I’ve had the opportunity to try so many different things and places in the city. I recently attended a Voga event at the Ritz Carlton downtown; thanks to my friend and Associate Editor at Where Magazine, Sarah Perkins. The Voga event (you heard right, mix between Yoga and Vogue) was an opportunity for us to tour the beautiful hotel space and partake in a voga session. This was no regular yoga session as our yoga instructor greeted us with bottled water and a pair of sunglasses when we arrived. Then we were escorted to the 75th floor rooftop for our session. I’m not even sure how I lasted through the session, given the absolutely breathtaking and overwhelming city view we were surrounded by. After a very relaxing, fun and 80’s inspired voga class, we were hosted by the marketing team for cocktails on the hotel patio. What more can one ask to get the weekend started off right! Alas, now yoga will never be the same. The next week, I attended a fantastic Wine & Wardrobe event at Seven Lions. The event presented an intimate wine tasting with owner and Master Sommelier Alpana Singh and wardrobe stylist Drew Harris to give us some styling techniques and share some essential closet organizing rules. As a Professional Organizer & owner of Organizing With You, Inc., this was naturally the perfect fit for me- food, wine and organizing! The event was particularly special because guests brought items to donate to Deborah’s Place, an organization that provides housing for single women experiencing homelessness. What a great cause and evening altogether! Back to a more food centric event, I went to a tasting at Roti Mediterranean Grill, in the loop. 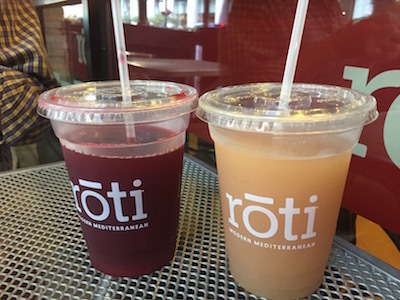 Typically, I wouldn’t think to stop by a casual, fast food place like Roti on my seafood expeditions, but I believe this tasting has changed that for me and I will be doing more of that! At the tasting, they had me try their new Salmon Kabobs and from the very start I was amazed at the quality of the meat and well as the numerous healthy options they offer. Honest to goodness food, just like their tagline suggests. At the restaurant, your meal can be ordered as a salad, sandwich or a rice plate, so I had my juicy salmon skewer over a bed of lettuce, sumac onions, garlic sauce, tahini and feta cheese. What’s not flavorful about that! The fish was at par with the fish I’ve eaten at some of the quality seafood restaurants in the city. The salmon at Roti comes from the Gulf of Maine with a 3 star best agriculture rating. Who says sustainable seafood is only available at fancy seafood restaurants! I also got to try some of their incredibly refreshing beverages such as the White Peach Green Tea; the perfect summer drink to accompany fish. I have to say, I went in with no expectations but was pleasantly blown away. And I can’t wait for more Roti soon! That same week, I was also invited to experience Kings in Lincoln Park, the new Boston based entertainment spot offering bowling, gaming, and scratch made food, including coal-fire pizza. I got to sample their maple glazed sea scallops, salmon and other delicious seafood. Typically, you don’t see an extensive seafood selection at these types of places, but at King’s I can happily say that pescetarians have been accounted for! A more in-depth write-up on my experience there is coming soon!